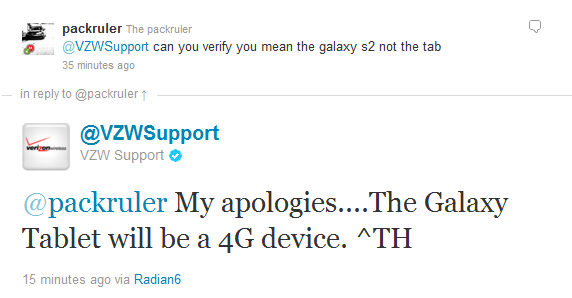 Update: As if we didn't all see it coming (you should see all of the @mentions we received on Twitter regarding VZWsupport's history of ignorance when this post when live), Verizon Support just tweeted that they were actually referring to the Galaxy Tab 10.1, not the Galaxy S II. One of these days, Verizon should probably consider hiring support people that actually know something about the products in which they support, instead of a group of neophytes that know as much about technology as my eighty-six year old grandmother (read: nothing). Here's some news that a lot of you have been waiting to hear: the Verizon branded Samsung Galaxy S II will have 4G LTE -- if the @VZWsupport Twitter account is to be believed, that is. So often we hear of things like this, only to later find out that the representative manning the keyboard at that exact moment dropped the ball, made a mistake, or was flat-out wrong. Hopefully that will not be the case in this instance, because if I've learned one thing about GSII hopefuls, it's that they're very passionate about the inclusion of 4G LTE in this monster device. So, VZW, now that you've instilled hope and excitement into your customers, you damn sure better deliver.